Travelling Monument – Travelling Queen? Queen Berengaria died in Le Mans at the end of the year 1230 at about the age of 60, and was buried outside the city in her foundation, the abbey of L’Épau. There is no record of the exact site of her burial but, as the abbey church itself was not completed until the first half of the 14th century, the grave must have been elsewhere, most likely, as was the Cistercian practice, in the chapter house. The effigy and the original tomb chest date from the latter part of the 13th century; however this tomb chest is now lost, apart from some fragments which are now fixed to the wall in the abbey. In later seventeenth century the French antiquary Roger de Gaignières commissioned artists to record the antiquities of France. At l’Epau the artist was Louis Boudan, who recorded a wall mounted bronze plaque (now lost) with a Latin inscription referring to the foundation of the abbey by Berengaria and stating that in 1609 the Queen was ‘buried in this spot’. This would seem to indicate that the monument at that time stood near the site of the plaque, against the wall of the choir. However, excavations carried out in the mid 20th century did not discover any burial vault or sarcophagus in this area. In 1672, according to an inscribed slate (which see below) the monument was moved to ‘a more sacred place’ presumably before the high altar. At this time also a new tomb chest – the one drawn by Stothard – was constructed. The late 1600’s were a period when the abbey had fallen into decay and was undergoing much restoration work. 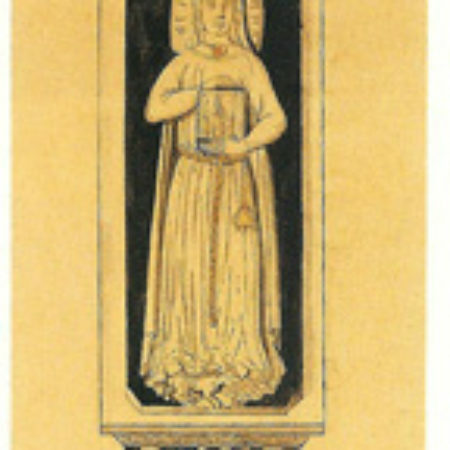 The several drawings commissioned by Gaignières include one of the monument and a plan showing it to be then situated in the choir. 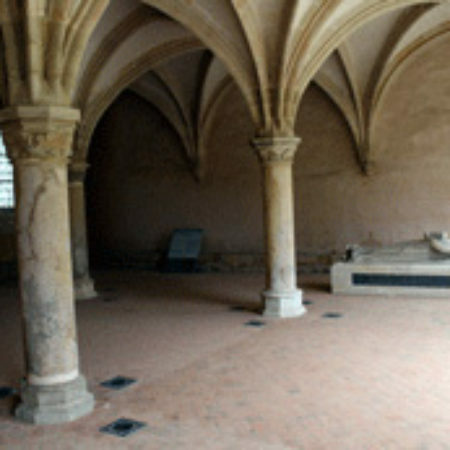 Furthermore a plan of the chapter house shows a series of inscribed stones which, at the end of the 100 years’ war, had been laid to indicate the various burials in that place; only one site remained unmarked and that was the vault to the right of the entrance which was discovered in 1960, and which is described below. Charles Stothard, the English antiquarian draughtsman, visited L’Épau Abbey in 1816 to see if Berengaria’s tomb had survived the Revolution only to find the abbey church a ruin and converted into a barn. He reported that fragments of the tomb chest were found ‘lying about the place’ but the Queen’s effigy was concealed under a ‘considerable quantity of wheat’. This tomb of the most serene Berengaria, Queen of England, the noble founder of this monastery was restored and moved to this more sacred place. In it again were deposited the bones which were found in the ancient sepulchre, on the 27th May, in the year of Our Lord 1672. This slate was found to be in the possession of a canon of Le Mans Cathedral, which in Stothard’s time was undergoing restoration, and it was suggested to the superintendent of that work that the tomb be moved to the safety of the Cathedral. In 1861 the monument was moved to make way for that of Monsignor Bouvier and re-sited in the nave. In 1920 it was again moved back to near its original position to make way for a war memorial. 1. A bottle sealed with red wax containing a report of the translation of 1861 and a coin of 1858 and two of 1854. 2. Several long bones wrapped in linen: two matching femurs, a portion of a left tibia, and a portion of a femur belonging to a young girl of between 15 and 16. 3. The above mentioned inscribed slate plate. The chest was then resealed and a new report and several coins of the time added to the contents. Note that fabric mentioned by Stothard had disappeared and there was no report about the translation from l’Epau. M. Pierre Térouanne in June 1960 uncovered in the Chapter House of L’Épau Abbey a burial vault in which, under a pile of debris, lay a skeleton of a woman; this skeleton was correctly articulated having become set into the solidified material in the floor of this vault. Only the skull had become detached and had suffered some minor damage, possible when the vault had been filled in at a later date. The bones were examined in 1963 in the University of Caen’s department of anthropology by a team led by Dr Dastugue, who reported that the skeleton was that of a woman of 60 – 65 years of age and 1.57 m tall. There were fragments of brass attached to the skull which were thought to be remnants of a crown which had been removed at some point. Furthermore the excavations show the foundations of benches around the wall of the chapter house. However there is a break in the continuity of these around the vault which may well indicate that the monument originally stood over the vault and the space was left for the monks to surround the tomb. From the discussion above we can conclude that Berengaria was buried in the chapter house in the vault discovered in 1960 on which later was placed the effigy on its original tomb chest. During the 100 years war, in fear of the looting that was to come, the monks fled from the abbey taking with them all portable valuables to the relative safety of Le Mans. The monks may then have opened the vault, removed the crown from Berengaria’s head with any other valuables and filled the vault with rubble to hide her skeleton. They may well have removed some bones from the nearby lay cemetery and put them in the tomb chest to act as a decoy preventing the looters desecrating the Queen’s actual grave. The tomb was moved into the abbey church in 1609 and again in 1679 when the effigy was restored and a new tomb chest constructed. Charles Stothard discovered the monument dismantled in 1816 in the abbey church and it was subsequently moved into Le Mans Cathedral where a bronze inscription was added. Here it was moved several times and the mortuary chest in the tomb chest opened and examined. In 1984 Berengaria’s effigy was returned to l’Epau without its 17th century tomb chest and mortuary chest. 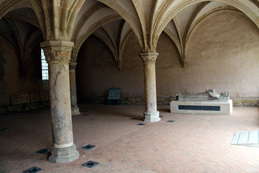 Initially the effigy was placed in one of the chapels in the abbey church and a new base constructed; in 1988 the monument returned to its original place, over the vault in the chapter house. The plate describing its removal to Le Mans Cathedral was reattached to the new base, although now giving a rather confusing account.